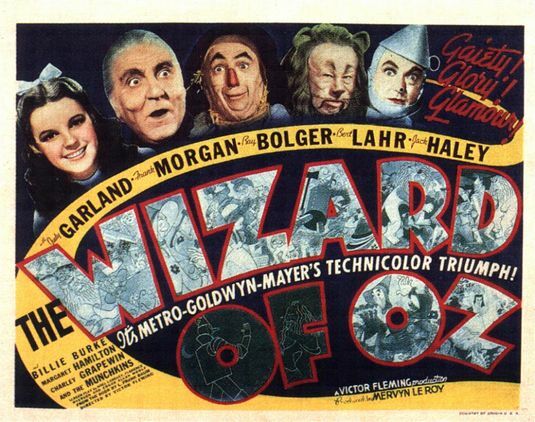 Plot: On a farm in Kansas, Dorothy Gale (Judy Garland) has to defend her dog, Toto, from the angry reproach of her neighbor, Mrs. Gulch (Margaret Hamilton). Because Toto has bitten Gulch, she’s within her rights to take the dog and have it destroyed. Dorothy and Toto run away, encountering a carnival performer called Professor Marvel (Frank Morgan), who convinces her to return home to her upset Uncle Henry and Aunt Em (Charley Grapewin & Clara Blandwick). When she returns, a tornado has sprung up and her family is hiding in the storm cellar. Dorothy and Toto rush into the farmhouse, which the tornado plucks from the ground and hurls through the air. Dorothy crashes in a brilliantly colorful land called Oz, where she finds herself the darling of a group of small people called Munchkins. She is met by a good witch named Glinda (Billie Burke), who explains that Dorothy’s house crushed the tyrannical Wicked Witch of the East. Her sister, the Wicked Witch of the West (Hamilton again) arrives for vengeance, but finds she cannot harm Dorothy directly, as Glinda has given her the dead witch’s powerfully magic Ruby Slippers. Glinda sets Dorothy on a path to the fabled Emerald City, where the Wizard of Oz may be able to help her get home. Along the way she is joined by three others, each who need help from the Wizard: a living Scarecrow (Ray Bolger) was made without a brain, a Tin Woodsman (Jack Haley) who was crafted without a heart, and a Lion (Bert Lahr) who is sadly a coward. The three of them encounter the witch several times, narrowly escaping her traps before finally arriving in the Emerald City. When they go into the Wizard’s chambers, they encounter an enormous floating head that tells them he can grant their wishes, but will only do so if they can bring him the broomstick of the Wicked Witch of the West. Dorothy and her friends travel to the Witch’s palace, where she is captured by the Witch’s flying monkeys. The other three disguise themselves as guards and rescue her, but encounter the witch upon escape. In desperation, Dorothy hurls a bucket of water at the witch, who immediately melts away, destroyed by her one weakness. Returning to the Emerald City, the Wizard tells them he needs time to think about their requests. As the friends despair, Toto discovers a little man (Morgan again) hiding behind a curtain, operating a machine that projects the image of the head. The Great and Powerful Wizard of Oz, it seems, is a humbug – a simple performer from the United States who accidentally drifted into Oz years ago in a hot air balloon. Recognizing that the Scarecrow, Tin Woodsman and Lion already possess those very things they most desire, he gives each of them a small token: a diploma to signify the Scarecrow’s wisdom, a testimonial in the shape of a heart for the Tin Woodsman, and a medal to proclaim the courage of the Lion. For Dorothy, though, the only thing he can do is repair his balloon and take her home himself. Before they’re about to leave, though, Toto leaps from the basket. Dorothy rushes after him, and the balloon drifts away with the Wizard alone. Dorothy fears she’ll be trapped in Oz forever, but Glinda appears again and reveals that the Ruby Slippers she wears have the power to transport her: she need only click her heels together three times and recite “There’s no place like home.” When Dorothy does this, the world swims around her and she wakes up back in Kansas, surrounded by her Aunt and Uncle, three farmhands who bear a striking resemblance to her friends in Oz, and Professor Marvel, who has come to check on her. Although they all believe she dreamed her adventure in Oz, Dorothy doesn’t care – she is content to simply be home. Thoughts: After yesterday’s somewhat disturbing look at a silent Oz, spending time with the MGM classic is just what I needed. This is the movie we all know and love, the apex of the musical fantasy, the film that virtually everybody in the world has seen as a child, hidden from the flying monkeys, sang along with the Munchkins, and then later pretended they didn’t like a few years later while going through a hipster phase. It is, in fact, a masterpiece. Although the film seemed like it was going to be a disaster for much of the production, with prospective directors and screenwriters playing musical chairs before we finally landed on the people who got the credit, the final result is something that was spectacular to look at in 1939 and is still lovely today. The transition from the sepia tone of Kansas to the brilliant color of Oz is beautiful both artistically and technically. The shift demonstrates a transition from a sad, humdrum world into a place of incredible wonders, and when you consider most people in 1939 would never have seen much color before, it’s easy to see it as a game-changer. The color in this film mattered as a storytelling choice, it sold the idea that color can influence the telling of the tale. This was Al Jolson in The Jazz Singer all over again, looking at the camera and proclaiming “you ain’t seen nothin’ yet.” This (if I may briefly tangent) is why I still don’t care for 3-D movies – no matter how pretty any of them may be, I’ve yet to see a movie become more effective as a story because it is in 3-D, the way this film could never have been filmed in black and white. Judy Garland has become the gold standard for Dorothy Gale. Not only is the actress most identified with the role, but a vast majority of the artistic representations since then have used her likeness and costume as the basis, even though later Oz books specified her as blonde and depicted her in different clothes than the blue checkered dress. In truth, at 16 when the movie was filmed, Garland was really too old to fit the part as written (at one point, then 10-year-old Shirley Temple was a frontrunner for the role). Yet her youthful charm, innocence, and amazing voice sold her like few actresses have ever sold a part. You cannot use the name Dorothy without summoning up a vision of Judy Garland, and that’s all to the good. Despite the various cast changes, it’s now virtually impossible to imagine anyone filling in the other principle roles than the actors we had. Ray Bolger flawlessly plays the wise man who doesn’t understand his own worth, Jack Haley has tenderness without seeming weak, and Bert Lahr is a living cartoon, silly and heartwarming all at once. Morgan and Hamilton, similarly, have become the benchmark for their parts as the Wizard and Witch. Hamilton in particular deserves special credit, I think, taking a character who had little personality in the original novel and creating one of the most enduring villains in cinematic history. The film leaves out certain sequences from the book, and changes too many things for it to really succeed as an adaptation, but the alterations are forgivable in the context of the film MGM was trying to make. Sequences like the China town (brought back by Disney in this year’s Oz the Great and Powerful) would have been difficult to make convincing with the special effects of the time. Other scenes featured Dorothy’s friends getting rather violent in defense of the little girl – could you imagine seeing Ray Bolger standing atop a pile of crows after snapping their necks or Jack Haley swinging his axe to behead a pack of ravenous wolves? The original story left a lot of blood on the page that never made it to the movie screen, and that’s honestly okay. This is one of those films that’s so well-known, so well-loved, it’s hard to imagine anything I could say that hasn’t been said already. As an Oz fan, I’m still waiting for a truly faithful adaptation of the L. Frank Baum novel, but as a fan of musical cinema, this is one of the greatest movies ever made. Posted on April 23, 2013, in 4-Icons, Fantasy, Musical and tagged 1939, Bert Lahr, Billie Burke, Charley Grapewin, Clara Blandick, Edgar Allan Woolf, Florence Ryerson, Frank Morgan, Jack Haley, Judy Garland, L. Frank Baum, Margaret Hamilton, Noel Langley, Ray Bolger, Victor Fleming, Wizard of Oz. Bookmark the permalink. 1 Comment. I agree with you on all counts on this one. I did not read the book until I was fourteen, so I did not realize the differences until the movie had cemented itself in my mind. Still, it is a wonderful piece of musical cinema and will always hold a special place in my heart. I did not know the bit about Shirley Temple. Interesting. I find myself curious about an alternate universe where that happened.